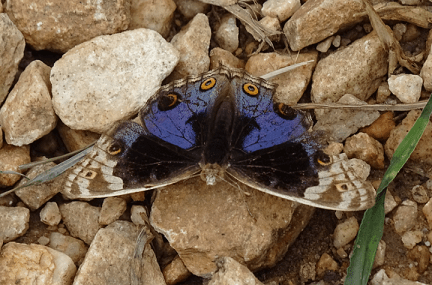 Blue pansy (Junonia orithya) complete detail – updated. 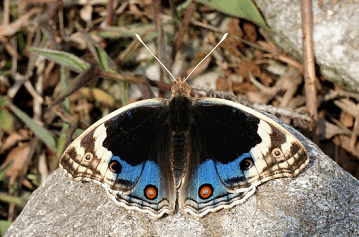 Description of Blue pansy (Junonia orithya). 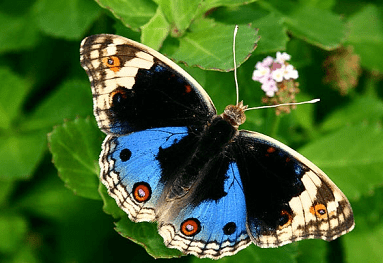 Classification of Blue pansy (Junonia orithya). Habit and habitat of Blue pansy (Junonia orithya). They prefer open habitats, like grasslands, wastelands, woodlands, open forest areas and farmlands. The color of body is dark bright black or brown. The head is bifurcated and black with an orange patch and 2 spines. Both sexes are similar in color and pattern, but the male has more extensive areas of blue, and smaller ocelli on the hind wings. Antennae white or dirty white, head reddish brown, thorax and abdomen above brownish black, thorax and abdomen beneath dull white……….. Females are similar but larger and more clearly defined ocelli and markings. The female is dirty brown on the upper side, and may contain some blue on the hind wings. The undersides of both sexes are a pale brown, with a variety of markings in orange and white plus black/blue eye spots. 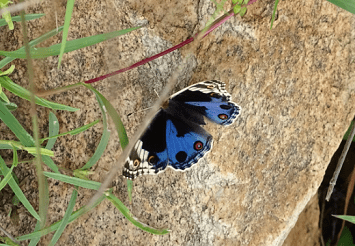 Each wing has two eye spots on both the upper and lower surfaces……………..
Blue pansy is a sun-loving species, which can usually be found on grassy patches in open areas. Males can sometimes be found in numbers. The greenish eggs are laid singly on the young leaves or shoots of the host plant or other plants. 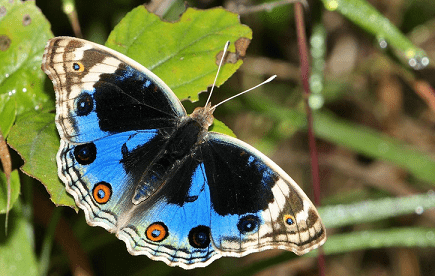 Blue pansy is a beautiful butterfly, with a wingspan is about 4 cm. In the larvae stage body covered with perpendicular spines, and armed with strong radial hairs. The color of body is dark bright black or brown. The head is bifurcated and black with an orange patch and 2 spines. Blue pansy larvae have small spinous process in the angle of each eye. In the pupae stage the color of body is purple, and suspended by tail. The wing-covers are muddy yellow in color, and variegated by lines of a dull creamy white. 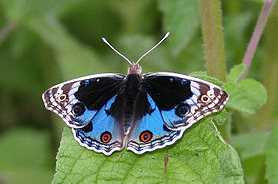 The adult butterflies have black forewings with white marks, and blue hind wings. The hind wings of male is a bright blue with an orange-red subtornal ocellus. Hind wing blue shaded with velvety black towards base, a postdiscal black white-centred orange and black-ringed ocellus in interspace 2, a round minutely white-centred velvety black spot. Females are similar but larger and more clearly defined ocelli and markings. The female is dirty brown on the upper side, and may contain some blue on the hind wings. The undersides of both sexes are a pale brown, with a variety of markings in orange and white plus black/blue eye spots. Each wing has two eye spots on both the upper and lower surfaces. Antennae white or dirty white, head reddish brown, thorax and abdomen above brownish black, thorax and abdomen beneath dull white. Both sexes are similar in color and pattern, but the male has more extensive areas of blue, and smaller ocelli on the hind wings. Blue pansy found in Africa,southern and south-eastern Asia, and Australia. They prefer open habitats, like grasslands, wastelands, woodlands, open forest areas, and farmlands. They found at elevations between sea level and about 300 to 500 meters. They also found in parks and gardens. They tend to visit tiny flowers growing in grassy areas, and sunbathe with wings fully open. The flight is rapid and typically done in a gliding fashion. Both sexes nectar at a wide variety of wild or cultivated flowers. Blue pansy is a sun-loving species, which can usually be found on grassy patches in open areas. Males can sometimes be found in numbers. The greenish eggs are laid singly on the young leaves or shoots of the host plant or other plants.